Wi-Fi networks populate our urban environments and create intersecting boundaries within physical space. These territories provide us with new and interesting topographies especially if we consider the creative potential of these new spaces. 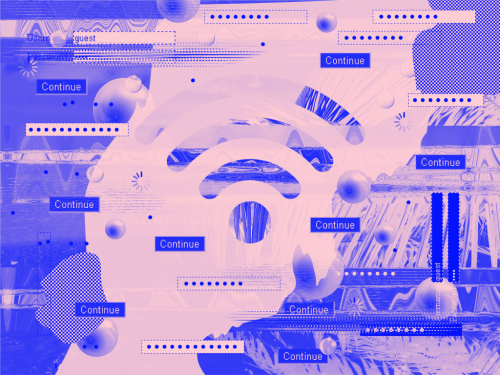 Captive portals provide a temporary gateway to the Internet, generally a place for businesses to harvest data but for us a place to provocatively host digital artworks. With this we creatively explore captive portal technology as a place to embed artwork in public space. This curated collection of artworks will exist in the urban environment around Nantes hosted on small autonomous Wi-Fi routers. Each work is available through a web-enable device (smart phone, tablet or laptop). To access the piece connect to the Wi-Fi name related to the artwork and a captive portal will appear on screen. “If you are not paying for it, you’re not the customer; you’re the product being sold”. This phrase said by Andrew Lewis aka blue_beetle in 2010 should make any user wary of using free services. The promises of corporations offering “exclusive” “premium” gifts – loyalty cards, free wifi, vouchers etc – is that it will make your life better, easier, help you, help others, and ultimately make the world a better place. By accepting these “gifts” we give permission to these corporations to enter our lives, track our social, spending, and general living habits. With this information they can greatly influence the opinion and habits of us and our social circles. These free “gifts”, then, come at a price. Using Free Basics (previously Internet.org) as its target, which is Facebook’s failed attempt to gift “free internet” to India, Freemium Basics sheds light on the dangers of clicking “I Accept” on free services without considering the costs. If you happen to be in Nantes log on!! !